Illicitly and unconstitutionally spying on a whole nation requires an enormous amount of taxpayers' money. 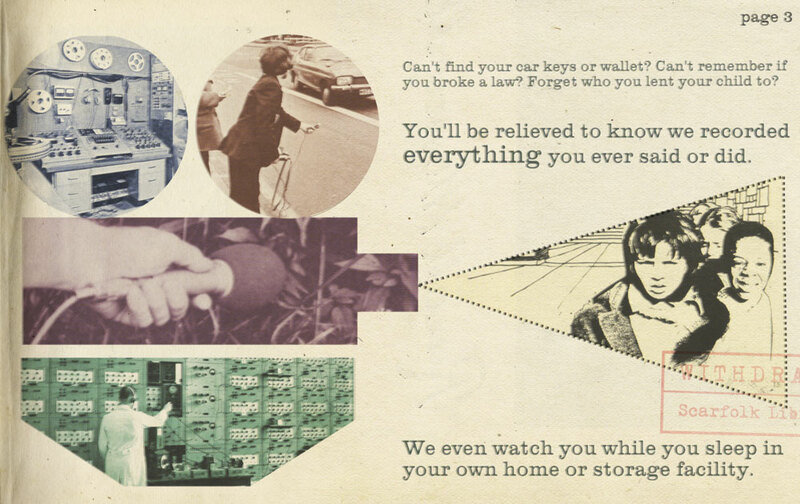 That is why, in 1973, Scarfolk started a scheme to sell surveillance data to the public, the actual object of the aforementioned spying. 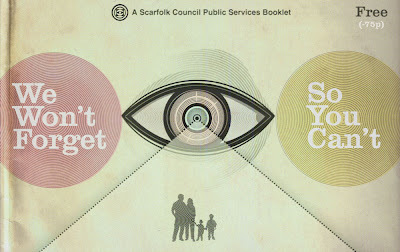 By 1970, Scarfolk Council had bugged every room, every street, every public and private space. Even forests, beaches and bouncy castles were wiretapped. Every moment of every resident's life was recorded and archived in vast bunkers in the mountains of Snowdonia and abroad. All this information was subcontracted to a consortium of corporations called RIMPS that used the data to exploit citizens' psychological weaknesses and/or blackmail them into acts of personal depravity for entertainment. These acts were televised and had viewing figures of millions per broadcast. Many people became household names as shame and celebrity became synonymous. Until 1978 foreigners were officially classified by the government as livestock and were subcategorised by odour. Defining who was and wasn't English became complicated. 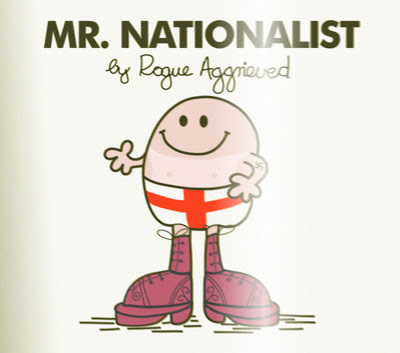 By the end of the decade, right-wing nationalists had drawn up a list that demanded the deportation of everyone apart from 9 people, all of who claimed to be the only true English. They even insisted on the deportation of all foreign foods (which they later amended, granting visas to pizza, kebab and curry sauce). "We reject foreign influences in England. That is our weltanschauung. Multiculturalism is our bête noire and we strongly believe that English culture is destined to become kaput if the current zeitgeist continues to be de rigueur. But it doesn't have to be a fait accompli and that's why we will continue to be the enfant terrible of modern politics. It's time to act: Carpe diem!" Back in the 1970s there was no way of ascertaining how some medical products might affect humans. Rabbits, chimps and other animals were needed for dark ritualistic purposes and human volunteers were not forthcoming, especially after several high-profile medical scandals. The Cavalier Pharmaceutical Company hit on the brilliant idea of publishing a series of primary school science and maths books. 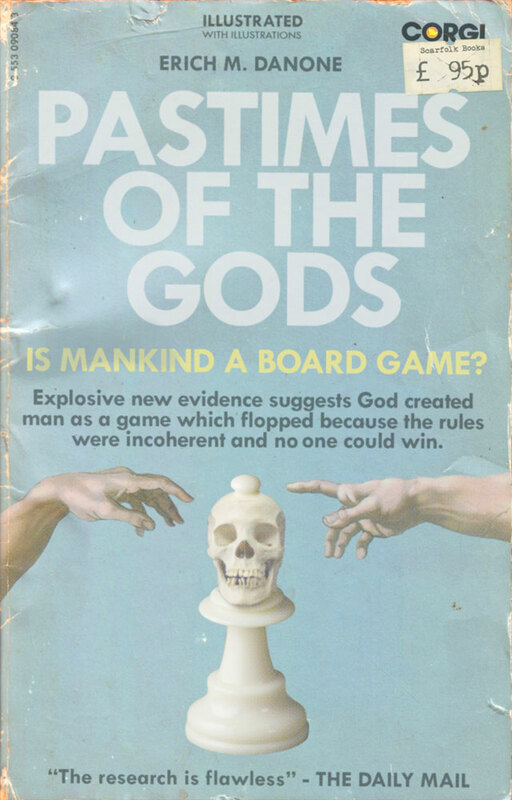 They donated them along with a generous endowment to Scarfolk Education Board which had no choice but to introduce the books to the curriculum. 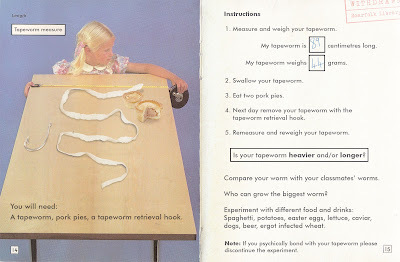 The textbooks invited young children to conduct experiments on themselves and record the data, which contributed to higher end-of-year grades. The best scoring pupils from each school were awarded the chance to try out the medicine to which their schoolwork had contributed. 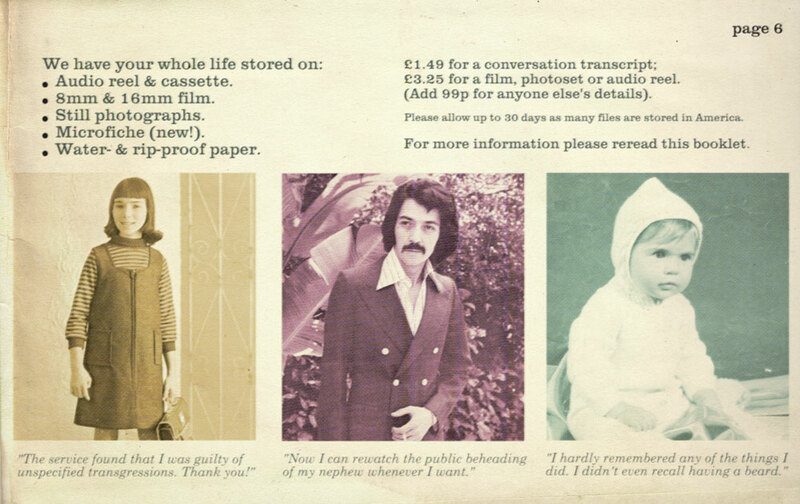 They also won free cigarettes, as well as courses of either anti-seizure or anti-psychotic medication. There's another page from the Scarfolk maths and science book here. Scarfolk had its fair share of UFO/deity conspiracies in the 1970s. The town's resident UFO expert Bert Cage insisted that extraterrestrials have intervened in mankind's development for generations, introducing technology and even manipulating our genes. He claimed the otherwordly visitors have been responsible for: irrigation, rockets, fax machines, polyester bed sheets, dental floss and cocktail umbrellas; not to mention genetic emotional states such as: the disappointment one has seeing the film adaptation of a favourite book and the amusement one feels when seeing a cat fall over. According to Cage, there are also several significant changes due to mankind very soon. These include: Geo-spankhens (eta: 2017), colonspicers (2019) and the shame one feels for having eaten cabbage for so many years not realising that it's actually an animal (2032).